I finished big stitching the center of the tablecloth last night, and I must admit to being really pleased with the look and feel of it. The big stitches in red thread have such a nice look to it. 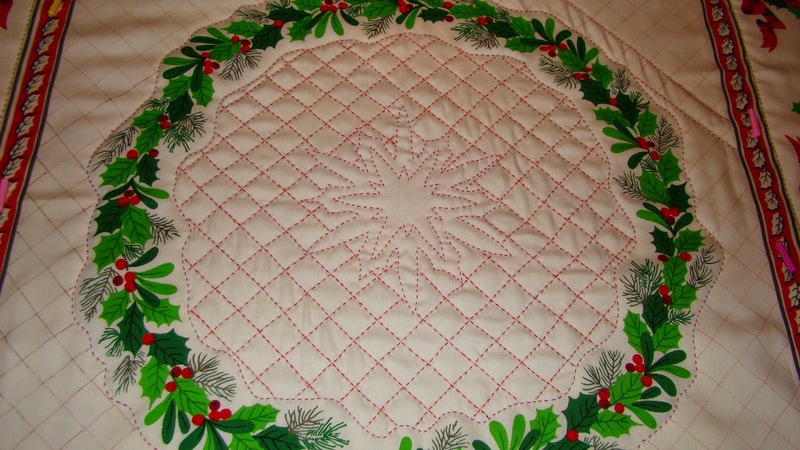 The center area is a snowflake which was stitched first and then followed up with the grid stitching. I did have to pick out a few stitched lines of the grid and redo them to ease in a bit of excess fabric but it was worth the extra effort. It lays nice and flat and really calls out to be touched. To aid my marking, I tried a new-to-me stencil from a company called fulllinestencil and I must admit to being quite stricken in a good way to it. It's similar to screen print where what you want to be inked is open and the rest of it is blacked out. You use a chalk called Quilt Pounce to slide across the stencil to mark your stencil. Don't do an up and down pouncing movement or you will end up with a face full of chalk dust and no nice line on your cloth. Just rub smoothly across the stencil and it works perfectly. Unfortunately, my tablecloth material did not like holding on to the chalk so any touching of the fabric rubbed the chalk right off and left me with nothing to follow. Disappointed but not daunted, I pulled out my go-to marking product -- Crayola Fine Line Ultra-Clean Washable Markers. I used the orange marker and marked right on top of the chalk line. It didn't take too long and the nice thing is that I was able to mark a very fine line on top of the chalk...finer than I would have marked had I just started off with the marker from the beginning. I'll report on the stencils again once I have more experience using them on 100 percent cotton fabric. Slow stitching is so therapeutic. I'm pretty sure my heart rate goes down and my breathing slows as I take each stitch into the cloth. My goal was to finish the center so I could share my progress with you, but I did take a wrong turn that stopped everything for about an hour. I'll paint a picture of what happened. Here I am happily stitching away in my Lazy Boy chair. Dillan, my baby dog, is situated in between my legs and underneath the tablecloth (it's terrible keeping him off of anything that resembles a quilt because obviously everyone knows that ALL quilts belong to HIM). I had just run out of thread and threaded my needle, which by the way is not a small needle (#20 Tulip Chenille needle). My knot was popped inside of the batting when I did something I should not have and reached for an object. At exactly that same moment my needle magically disappeared into thin air. Now I know what you must be thinking because I have already thought it. The needle must have slipped off and fallen on your lap, chair, tablecloth, floor...yada, yada, yada. When a needle is dropped, everything stops until said needle is found and safely back where it needs to be. Dillan was grudgingly and under very loud protest put into his crate. All lights were turned on and with flashlight in hand, I searched and searched and searched for the missing needle. For the first time ever I could not find the needle. I am thinking to myself -- how could such a big needle hide from me. I ran my hand down each side of the chair hoping to actually poke myself and locate it. The floor was scoured back and forth with flashlight hoping to catch a glimmer of the shiny needle. The tablecloth was searched repeatedly and even squeezed multiple times because needles do not just disappear in thin air. Finally and as a last resort I pulled out the vacuum cleaner. Surely, I would be able to find it now, but to no avail. By the time I was done vacuuming, my eyes were blurry and sleep was calling. As I fell to sleep I just knew that the morning light would bring closure to the hidden needle. However, this morning the needle remains a mystery. I even removed the back off my chair thinking it had to...just had to have been wedged there somewhere, but to my disappointment, no needle was found. Has this ever happened to you? I'm considering all possibilities now! Could it be that my arm movement last night broke through the space-time continuum! Who knows where it landed but let's hope a quilter finds it and puts it to good use. JoJo, what about your clothes? Were you wearing a sweater that it possibly got caught in? Hope you find it before Dillan goes crazy in the crate!